I can’t honestly tell you how or when I discovered Richard Cheese and the Lounge Against the Machine. I do know it resulted me in instantly ordering CDs. And outside of the albums that just compile already released material; I’ve bought each new release since. I’m a fan of his “swankifacation” of music. So I was pretty surprised when I received an email asking for help. 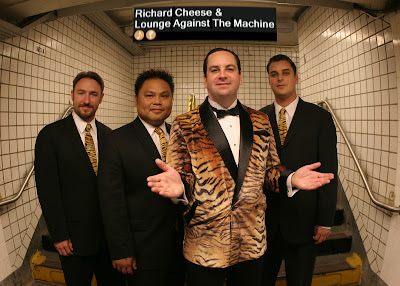 Mark Jonathan Davis aka Richard Cheese aka Johnny Aloha needs a corneal transplant. He was born with deformed corneas so he was unable to get any type of health insurance, which means he has to pay for the operation out of pocket. His indiegogo fundraiser explains the whole situation far better than I can. Here is the good news; with 10 days left in the fundraiser he has already raised 21,700. So he’s reached his goal, but considering he had two surgeries last year all additional funding will still help a lot. Check out the indiegogo fundraiser by clicking HERE. There are great incentives still available. I’ll be getting a signed copy of his book, but I’m pretty tempted to have him call me on my birthday.